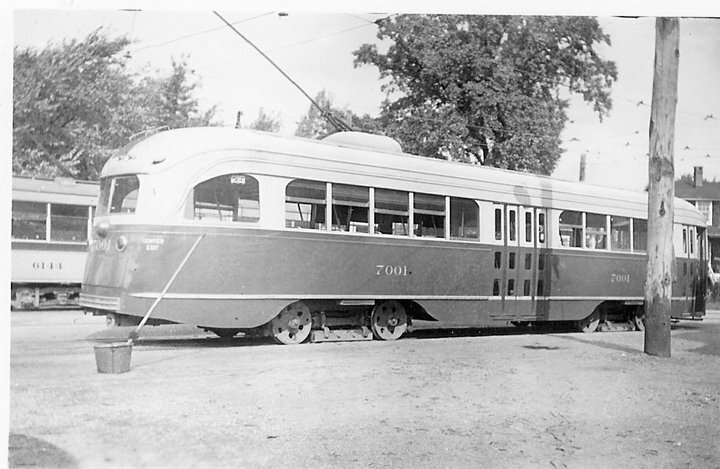 All of the prewar PCC cars by Pullman-Standard had standard air-electric B-2 trucks with outside brake shoes and the CS195B Form III "nutted" super-resilient wheel. The 1944-45 "Wartime" cars were delivered with air electric B-2 trucks, outside brake shoes and regular Form I resilient wheels. The 1946 all-electrics had B2 trucks, drum brakes with small actuators and CS195A Form II regular super-resilient wheel. The 1946 air-electric cars were delivered with air electric B2 trucks and CS195 Form I regular resilient wheels, though sometime in 1947-48 experiments were done with drum brakes and a lot of cars were retrofitted; some of these had super-resilient wheels of both types; many cars also got overhead fans in the process. All cars had resilient wheels of all three types mixed at times until the "T" began experimenting with solid steel wheels, automotive shock absorbers, and steel instead of rubber springing in the B2 trucks under the 50 picture window cars. It was thought that these cars would ride better on the open track characteristic of the 12 mile Riverside line. There were reports of alleged loosening of the nuts on the resilient wheels because of the high speed service, though this was never proved to my knowledge. The MTA did paint a yellow line about an inch wide from the edge of the wheel tread through the edge of the resilient wheel cover to see if the sandwich moved in service - and continues to do it to this day on the LRV's and Type 8 cars. I must add to this story one thing: Chicago CTA had begun converting it's early B2 PCC rapid transit trucks to solid wheels at this time, too, so there is a precedent...[to using solid steel wheels]. 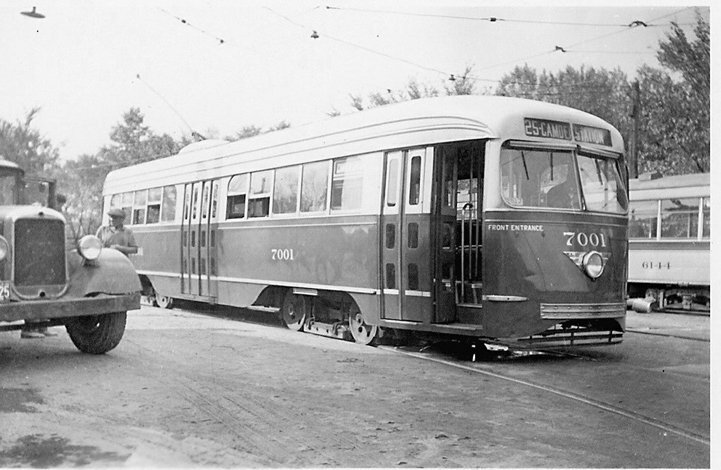 Deemed a success, all of the PCC cars were gradually converted to solid steel wheels. First the rear truck was converted. leaving the front truck alone. The front truck had the hand brake rigging; (at least on the outside brake rigged cars) and there may have been an engineering problem at first -- so these trucks were not done for some time thereafter. So, it was very common to see cars with the resilient wheels on the forward truck and solids on the rear. At times you would observe super-resilient wheels of different types on the same truck. Eventually, whatever the problem, it was solved and the front trucks were done. By 1966 or so, all cars had the solid wheels. The solid wheels were ordinary steel wheels with about a 2 - 2 1/2 inch tread thickness. 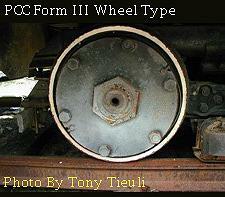 All Boston PCC car trucks had brackets extending from the frames (near the brake shoe assembly or shock absorber mounts) to which was affixed an approximately 1" x 4" x 5 1/2' wood board to act as a wheel guard. 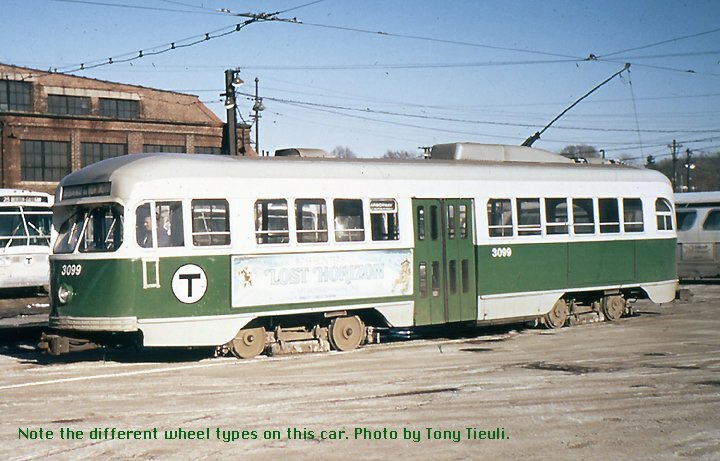 (All Boston conventional cars had them, too) As you probably know, carpetbaggers from the Boston system got rid of the HB lifeguards in Philadelphia and substituted the above arrangement on the GOH cars and any others still around. The LRV's all came with "acoustaflex" wheels which did not satisfy the T and eventually they were replaced by "Saab" wheels which look very much like the super-resilient PCC wheels, except the "nuts" are countersunk into the wheel and do not stand proud of the surface. Now: The two St. Petersburg cars available now (1951 and 1959) had the Form III super resilient wheels. The 1959 model can have solid wheels and be prototypical as they were slowly fitted with them and the paint scheme stayed the same. The gray, white and yellow cars, green and white, etc., which came later ALL had solid wheels. There is one other type of PCC wheel. These were used on Baltimore PCC cars. For a lack of a better term we can refer to them as "holed" wheels, or for a more formal name, "CS195C - Form IV". These are not sold separately but can be ordered with any set of B2 trucks. There is a $21.50 surcharge for using this style of wheel on B2 trucks. Prototype photos provided by John Engleman and Carvey Davis.